The equity put/call ratios on both the ISE and CBOE were more extreme yesterday than anything we saw in January. However, we are still unlikely to see the type of decline we saw in January because longer term measures are not yet stretched. 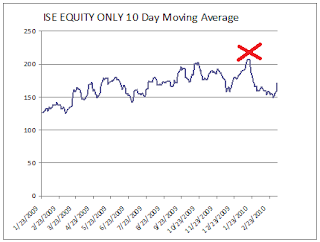 Looking at a 10 day moving average of the CBOE and ISE Equity ONLY we are nowhere near the extremes seen in January, as the charts below show. I marked the January extremes with an X. That is because we only started seeing bullishness after the Jobs report this past Friday, whereas in January we had a long period of bullishness. 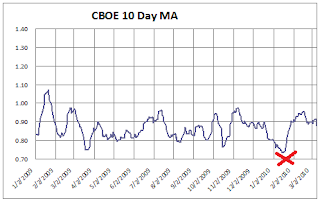 Sentiment surveys are not yet registering the type of extreme readings we saw in January. Investors Intelligence bulls chimed in today at about 45%, while we saw readings above 50% in January. Seasonality is positive now as well. I expect that the the extreme put/call readings and the overbought reading will lead to a pullback but still believe the market will need to rally again afterward before we could see a better top.